ALFRED JAMISON. The citizens of Shelby County, who came here during the early history of this section and established themselves in what were then little villages and hamlets, have been active factors in the development and progress of the county. 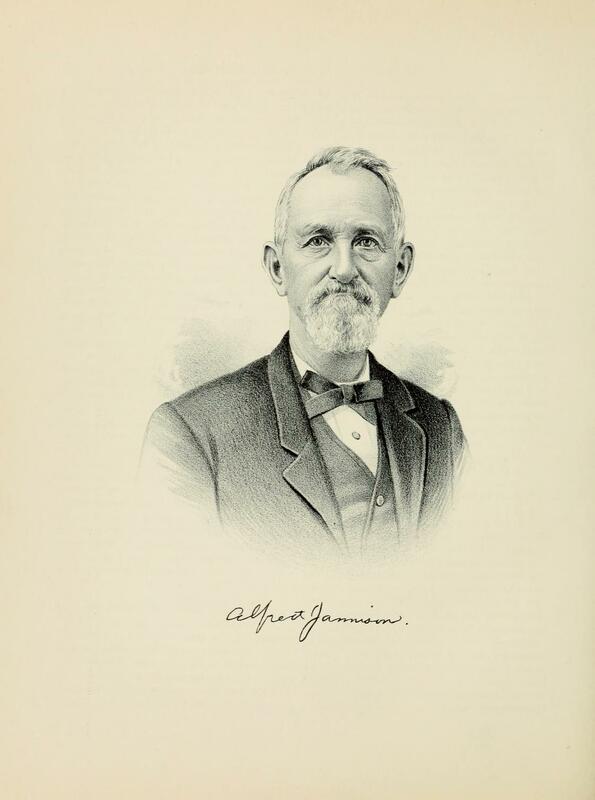 Mr. Jamison having been a resident of Oconee for more than twenty-five years, has made his mark upon the social and business interests of the place, and as an influential citizen we are pleased to present his portrait and biography to our readers. Mr. Jamison, who is a dealer in hay, coal, lumber and livestock at Oconee, was born in Monmouth County. N. J., February 17, 1814. His father, Joseph, a son of Jacob and Rebecca Jamison, was born October 2, 1781 in the same county. His mother was also a native there, and was born February 14, 1787, both she and her husband born near the historic battlefield of Monmouth. The children who gathered about this worthy couple were five sons and six daughters, as follows: Jacob J., born May 28, 1803; Abram B., November 18, 1804; Rebecca, November 30, 1806; Hannah, September 27, 1808; Joseph, December 7, 1810; Isaac, April 25, 1812; Lydia Ann, April 1, 1814; Mary, November 15, 1815; Sarah, March 23, 1818; Elizabeth, February 23, 1821; and the subject of our sketch, who was the youngest of the family. Of this large household, only Isaac, Mary, Sarah, Elizabeth and Alfred remain in this earthly life. Mr. Jamison received his education in the public schools of New Jersey, and when about sixteen years of age, he left the parental roof and went into the world for himself, first going to New York City, where he obtained a situation in a dry-goods store as a clerk. He continued in that position about five years, and then having accumulated a little money, returned to his native State and went into business, in which he had a one-fourth interest, establishing a general store at Cedar Creek. Here he continued for about two years, and then in 1849, having a serious attack of the "gold fever," he went to California by the way of the Strait of Magellan, and remained in the "Sunset State" for some time, occupying four years in the whole trip. Having been reasonably successful in his western venture, the young man returned to New York City, and engaged in the pork-packing business, which he carried on for fifteen years, but in the Spring of 1865 he closed out his concern there and came to Shelby County, locating at Oconee, where he has ever since resided. His marriage to Miss Gertrude Ellen Hegeman took place in New York City, April 5, 1853. This lady was born April 13, 1837, upon Long Island. N. Y. On arriving in Illinois, Mr. Jamison invested his means in real estate and milling, and had the misfortune to lose two mills by fire, but has continued in the real-estate business ever since coming West, in which he has been very successful. On locating here he purchased fifteen hundred acres of timber land, which he cleared up and worked the timber into lumber. He has been active in business all his lifetime, and still continues with unabated power to actively control his own affairs, although he is nearing the limits of three-score years and ten. To Mr. and Mrs. Jamison have been born the following children: Alonzo, born June 10, 1854; Alfred M., July 1, 1855; Emma Laur, May 28, 1858; Sarah Elizabeth, February 5, 1860; Brackett Badger, January 18, 1862; Harry Alonzo, January 9, 1864; Hattie H., March 22, 1865; Francis Richmond, October 12, 1867: Robert Hegeman, March 3, 1869; Grace Gertrude, June 2, 1871; Joseph Stokes, September 5, 1873; and Archibald Shelton, February 21, 1879. The six oldest are natives of New York City, and the younger members of the family were born in Oconee. The gentleman, whose life history we are here briefly sketching has been a life-long Democrat, and has always a lively interest in national, State and local politics. He is well read and broad in his views and keeps himself thoroughly informed in regard to public affairs, he is a member of Oconee Lodge, F. & A. M., and carries insurance in the Masonic Benevolent Society of Chicago. He was first made a Mason by Naval Lodge, No. 69, in the State of New York, in 1855, and was demitted from that to Oconee Lodge in 1873. Religiously the family may be considered as extremely liberal and strongly opposed to contention over the orthodox creed. The value of their lives and their work in this community can hardly be estimated, as they have ever been active in promoting the best interests of the neighborhood, and have been liberal in their means in forwarding ail movements looking to the material and social progress of Oconee. Extracted 13 Jan 2018 by Norma Hass from 1891 Portrait and Biographical Record of Shelby and Moultrie Counties Illinois, pages 448-450.